One in four Washington state households rely on Social Security benefits, along with 54 million people nationwide. As demand for benefits grows, so does the call for reforming the system. That cap is the Social Security collection limit on incomes above $106,800 per year (that number becomes $110,100 in 2012). All citizens earning incomes at that level and below are taxed 6.2 percent. An April 12 forum at Highline Community College promoted the lifting or outright removal of this cap. Doing so, proponents say, will increase benefits and strengthen Social Security by trillions of dollars. Ohio Congressman Dennis Kucinich delivered a fiery pitch for Social Security reform at Thursday’s forum. Kucinich, a Democrat, opposes the privatization Social Security as well as any cuts to benefits or a later retirement age. He says lifting the cap is a simple solution that will make Social Security solvent. As the retirement population increases, the ratio of working adults to retirees decreases, prompting fears that Social Security will go broke. Kucinich was referring to the Social Security trust fund, which is worth about $2.6 trillion, enough to help fully fund the system until 2037. Other factors such as a full-employment economy, he said, will mean more people pay into the system. One of the warmup speakers at Thursday’s forum was Federal Way resident Deanna Kirkpatrick. Her struggles and triumphs with multiple sclerosis were recently profiled in The Mirror. Six years ago, Kirkpatrick was diagnosed with transverse myelitis, a rare onset to multiple sclerosis. At one point, she was paralyzed up to her earlobes. At the Highline forum, Kirkpatrick said Social Security disability benefits were her safety net when battling the disease. She hopes that Social Security disability benefits will continue to be available to people in similar situations. The Social Security Works forum contained hints of a political stump speech by Kucinich. The former presidential candidate linked Social Security’s solvency to ideas such as a national manufacturing policy and a not-for-profit health care system. He also blamed the war in Iraq for wasting trillions of dollars. “It’s time we stood for peace in the world,” he said. Kucinich has generated political buzz about running for office in Washington state. Kucinich has not confirmed or dismissed whether he will seek the Congress seat being vacated by Jay Inslee, the Democratic candidate for governor. 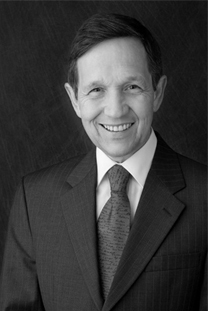 The liberal Kucinich, a former mayor of Cleveland, has served in the U.S. House of Representatives since 1997. His 10th congressional district in Ohio and that state’s 9th district were collapsed into one district due to the 2010 Census. Other guest speakers at the April 12 forum at Highline include Pramila Jayapal, executive director of OneAmerica; Marilyn Watkins, policy director, Economic Opportunity Institute; and Magdaleno Rose-Avila, executive director, The Latino Equality Initiative. Back in Washington, D.C., lawmakers including Vermont Sen. Bernie Sanders have proposed legislation for Social Security reform that specifically addresses the tax cap. Sanders recently announced the formation of the Defend Social Security Caucus, which includes Washington Sen. Maria Cantwell. Video: An easy fix for Social Security – Scrap the Cap!